Power is something we all take for granted and I have been harping on about China’s power elephant here. 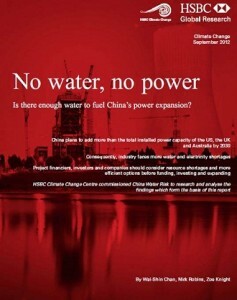 So of course it is nice to see HSBC’s boldly titled research piece “No Water, No Power: Is there is enough water to fuel China’s power expansion?” This is a brief summary of the 24 page report. All charts in this piece are extracted from the report. Basically, it boils down to this… China plans to add 1.2TW which is more than the total installed power capacity of the US, UK and Australia by 2030 or 5.9x the total installed power capacity of India. That seems like a lot of power but really this just brings its per capita installed capacity up to 1.77kW/person, in line with the current G20 average. Most of this expansion is in thermal power (coal, gas and nuclear) and hydropower, all of which require water to generate on a daily basis. Water’s role in hydropower is obvious, but we often forget that water is used in thermal power generation for cooling purposes as well as in steam-drive turbine generators. In fact, 97% of power generated in China is reliant on water today. China’s big renewables drive only manages to reduce water-reliant power to 87% by 2030. That is still a large amount of power that requires water to fuel. In the US, power generation is the largest user of water, accounting for 49% of total water use. 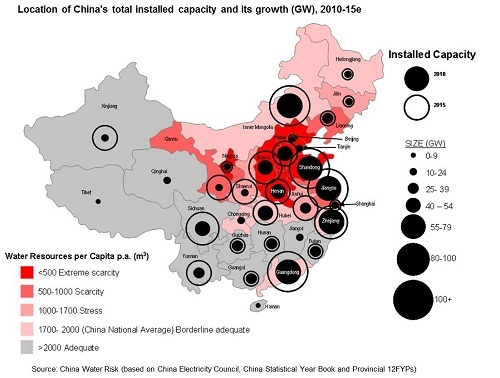 We estimate that less than 10% of water is used by the power sector in China today. So China has a long way to go. The water landscape is shifting: : physical, economic and regulatory changes are afoot. Climate change and pollution only serve to exacerbate water scarcity. So as water resources fall, water use is on the rise with growing affluence in China. The report warns that limited resources, new central water quotas and provincial caps could force a change in economic mix and eleven “Provinces at Risk” are identified including economic powerhouses Guangdong, Jiangsu and Shandong as well as Beijing, Tianjin and Shanghai, which incidentally has to reduce water by a -6.5% p.a. by 2015. Can these Provinces at Risk manage their energy and water targets? Project financiers, investors and companies beware: know your water risks or run the risk of being left high and dry. Is Fracking the Answer to Water Scarce China? 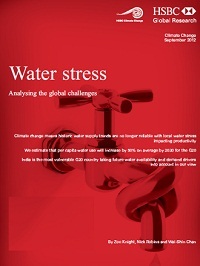 19 September 2012 – Water Stress: HSBC analyses global challenges ahead as climate change means historic water supply trends are no longer reliable with local water stress impacting productivity. Per capita water use is estimated to increse by 50% on average by 2030 for the G20. Debra heads the CWR team and has steered the CWR brand from idea to a leader in the water risk conversation globally. 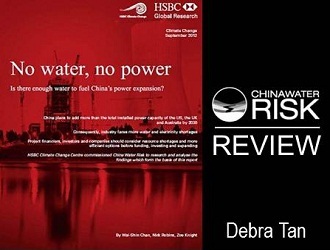 Reports she has written for and with financial institutions analyzing the impact of water risks on the Power, Mining, Agricultural and Textiles industries have been considered groundbreaking and instrumental in understanding not just China’s but future global water challenges. One of these led the fashion industry to nominate CWR as a finalist for the Global Leadership Awards in Sustainable Apparel; another is helping to build consensus toward water risk valuation. Debra is a prolific speaker on water risk delivering keynotes, participating in panel discussions at water prize seminars, numerous investor & industry conferences as well as G2G and academic forums. Before venturing into “water”, she worked in finance, spending over a decade as a chartered accountant and investment banker specializing in M&A and strategic advisory. Debra left banking to pursue her interest in photography and also ran and organized philanthropic and luxury holidays for a small but global private members travel network She has lived and worked in Beijing, HK, KL, London, New York and Singapore and spends her spare time exploring glaciers in Asia. Are Asia’s Savings Exposed To Water & Climate Risks?